Besides ragù alla napoletana, la genovese is probably the most iconic of all Neapolitan pasta sauces, and yet it is little known outside Italy or, for that matter, little seen outside Naples itself. And, for reasons I cannot quite figure out, it did not seem to survive the trans-Atlantic voyage; in my experience, la genovese does not form part of the Italian-American repertoire. All of which is really a shame, because this has got to be one of the most delicious sauces ever devised for dressing pastasciutta. The dish requires long, slow cooking but can simmer unattended for most of the time. Cover the bottom of a large pot, preferably either terracotta or enameled cast-iron, with a generous amount of olive oil or, if want true authenticity, melt a heaping wad of lard. I usually compromise and melt just a spoonful of lard in olive oil to give it that special savory flavor. Then add lots of finely chopped onion to the pot, along with a carrot and a stalk of celery, both chopped finely as well. Then add a nice, large piece of stewing beef—my favorite is chuck, for its rich flavor—and some finely chopped bits of salumi (salame, pancetta and/or prosciutto) along with a glassful of white wine or water. Season the ingredients well with salt and pepper. Cover and allow this mixture to simmer over very low heat for about 3 hours, uncovering the pot and stirring from time to time, and adding a bit of water if needed to keep the mixture moist, until the meat is fork-tender and the onion is well reduced and melted into a kind of ‘cream’. At the last, raise the heat and allow the onions to caramelize until they are nice golden brown color—but be sure not to burn them. Recipes range in the ratio of meat to onion, from almost 1:1 (usually a bit less meat than onion) to 1:2, with most calling for 1:1.5, as indicated here. The most common variation of this dish, much used for an everyday version of la genovese, is to omit the beef and simply use the bits of salumi to provide savor to the onions (it’s a good use for any spare bits that may be hanging around your fridge) or even no meat at all. Either of these versions can be called la finta genovese or ‘mock genovese’. Some recipes call for a bit of tomato purée or paste towards the end, by the original—and my preferred—version is in bianco. Some versions also call for adding a great deal of water, enough to immerse the meat, and letting it reduce over time, rather than adding it bit by bit, using the so called arrosto morto technique. The typical pasta, as mentioned, is ziti, especially the long type that you break into sections by hand (pictured in the post on zitoni al forno) but another stubby pasta like penne would also do. I have seen recipes calling for bucatini, also know as perciatelli, a kind of thick, hollow spaghetti that is popular in both Naples and Rome (and is indispensible to make the Roman classic bucatini all’amatriciana). Cover and allow this mixture to simmer over very low heat for about 3 hours, uncovering the pot and stirring from time to time, and adding a bit of water if needed to keep the mixture moist, until the meat is fork-tender and the onion is well reduced and melted into a kind of 'cream'. At the last, raise the heat and allow the onions to caramelize until they are nice golden brown color—but be sure not to burn them. You did well, Bill Fields; Italian regional cooking is hardly as codified as classic French cuisine and much more accepting of minor variations, especially when they allow for the use of what we have on hand. I made this today. I borrowed from a NYT recipe and yours. A whole lotta cooking later, I surprised my wife with penne rigate and sugo alla Genovese. Delicious and hearty! My family is from Avellino and Montella, but I never had this growing up. Probably because my brothers and I wouldn’t look at an onion if we knew what it was. Thanks for helping me recover a bit of my heritage with this wonderful dish. By the way, it’s probably sacrilege, but I used Marsala as my white wine. It didn’t hurt the dish at all, I think. Didn’t have any dry white open and had my eye on a cab for dinner. I was tempted to use the cab, but decided that the Marsala was closer to the recommended ingredient. Maybe next time. I love this sauce and feel in love with it when I was in chef school in Italy. I was taught to make it with a little pork as well as beef and we added milk to the sauce. We also used paccheri pasta. I love this sauce with paccheri, too, Thomas. Haven’t tried the milk technique but I imagine it sweetens the sauce nicely, a bit like adding milk to a ragù bolognese? Will give it a try next time. Thanks fo the tip! This dish once again reflects Italian ingenuity at its finest. Wonderful pasta dish as the seasons change, thank you Frank. One of the solaces of the chillier weather is the chance to enjoy these hearty dishes again. That and the chance to enjoy a nice, warming fire in the evenings! I made this yesterday! Not only is it delicious and easy to make, but it made my apartment smell really good and I had a hard time sleeping because it kept thinking of food. I may take some of the cooked chuck and put it on crusty French bread with some of the gravy for and pickles for a sandwich. Sorry you lost sleep over this recipe, Georgette… ? But so glad you like it. Thanks for stopping by! This seems very similar to the Ragù Bianco I made recently – I can’t wait to try this version. Everyone always seems to think that Genovese means “with pesto.” Obviously, that’s not the case… Beautiful dish, Frank! Indeed, I’ve seen that mistake made any number of times, including by people you’d think would know better. Thanks for stopping by, David! Fascinating: cannot wait to get in the kitchen ! The 3:2 onion:meat ratio is quite new to me as are the amounts of some of the other ingredients and some of the methodology. The slow, as needed, water addition reminds me of making risotto: an activity I enjoy on multiple levels . . . SO appreciate all the knowledge coming from other commenters today . . . what a feast of knowledge for the senses . . .
… and I wonder: how would it be to make this in a slow cooker? I’m sure this would work very well in a slow cooker. Just the kind of low, slow cooking that was made for that device. Excellent recipe; thanks! I’e seen versions that include some aromatics, like bay leaf and marjoram. Frank, like Kath I missed this when you posted it originally. I have a dear friend from Campania who first introduce me to this dish at a Sunday dinner. Such a wonderfully onion infused dish. I haven’t had it in some time but will be having it soon. Thanks for sharing. Thank you for this mouth-watering recipe Frank! I’ll be giving this recipe a go this coming week. My parents and the majority of our family come from a small town in Calabria called Sersale, I wonder if you’ve heard of it – not many people I’ve spoken to have and it is hard for me to find a website giving much detail on the town, it’s people and mostly, a collection of recipes from there. My Mother, who was the BEST cook in our family (cooking since she was old enough to hold a spoon!) has taught me everything about cooking the foods she was taught, but since she has passed, I am hoping to expand on the cooking of this area, wondering if you might be able to help with this. Thanks again for these amazing recipes! And thanks for your comment and sharing your story, Lina. I’m afraid I hadn’t heard of Sersale before. But your message does remind me that I’ve been meaning to feature more Calabrian dishes on the site. It’s a region I’ve neglected here, mostly because I’m not too familiar with it. But I’m anxious to get to know it better! I’m glad this caught my attention again (via your Facebook post)! I pinned it to try it sometime. Hope you like it, Kath! I think it’s a keeper. My mother in law use to make this for me all the time, since she passed no one knew how to make it. Thank God for this site, going to the store now. I was an au pair girl in Naples a long time ago and I’ve been looking for this recipe evet since. Just found your site. Thanks a lot. look forward to making it and having happy memories. This is a family favorite, made with a different variation. Lots of onion, prosciutto (chopped) and onion soup mix for more flavor and rich color (one packet should suffice). adds more flavor. Cook meat in all this broth (water is added also) and the meat flavor combines with the juices….amazing! pour over pasta and meat, serve! This is my first visit to your website. I plan to make the potato, onion & tomato tart, but decided to look around. In looking at the Neapolitan Beef and Onion Pasta Sauce I noticed a problem. We make this all the time with just a few differences: 5lbs of onions, 3 carrots and 3 celery stalks put in the food processor. Then after adding it to the pan with oil, we add ground beef. A few minutes later we add wine. Let it cook out and add water and 3-5 beef bullion cubes. Cook for 3 hours and eat with pasta! 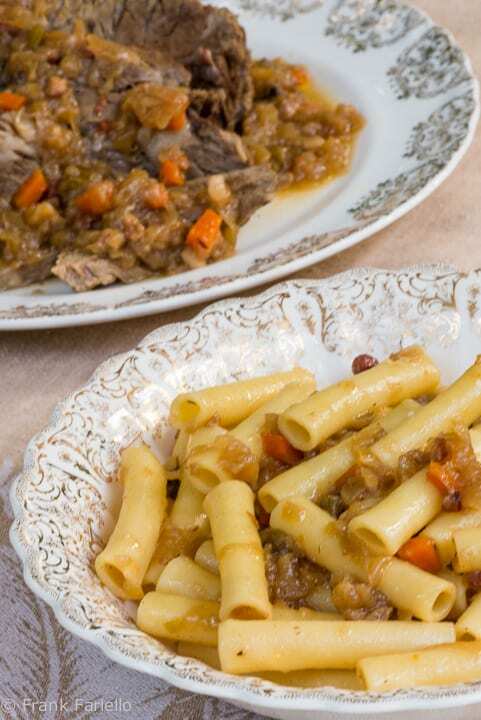 It's funny my grandmother always prepared for us “la genovese” as a second dish, the purpose of the sauce was to be served with the meat. I have to try that too, thanks for the wonderful idea! Genovese is one of my most favorite meals ever! My version is a bit different, but wonderful, too. If you'd like to see it go to http://cucinananette.blogspot.com and look at Feb. 27, 2010 “Ode To Joe and the Onion”. I'm new at blogging and not sure how to send you directly to that post. Hi, Frank. This is a wonderful post and an appeaing sauce I'll be sure to add to my repertoire. It's one which I've not had in Rome, Naples, or elsewhere. I'm a big fan of bucatini, with cherry tomatoes during the summer, so I always keep this pasta on hand. this is one of my favorite Neapolitan recipes, a secret that should not be so well kept! This is the type of dish only a Nonna can perfect. Oh we can all do variations on it but it's a Nonna thing for sure if you want it authentic. I do remember my grandmother with roasts in her pots for sauce. I do not know her recipe and I am sure the roast was indeed the next course – but I love imagining it was similar. All those lovely onions… waiting to be savored. I definitely want this … when it is below 90 degrees. That looks delicious. And thanks for the info. This is the kind of dish I love to learn about here. It's why I'm so hooked on buying Italian cookbooks, too, always hoping to learn something new. This Genovese dish looks great! Genovese is very,very tasty !!! This gives me reason to buy lard! Now I know what I'm going to do with the small chuck roast in my freezer. Thank you for all of the interesting information about la genovese, too! Pasta is perfect no matter what's on top–this looks yummy. Thanks!